Wedgewood Pharmacy is committed to serving both the human health and veterinary markets. Our most-common human health compounded preparations include: urology, obstetrics/gynecology, addiction, dentistry, endocrinology and dermatology. Our veterinary experience includes more than 20,000 preparations for companion animals like dogs, cats, birds, pocket pets; and horses; plus less-common animals like amphibians, hippopotami, and reptiles; and veterinary specialties in ophthalmology, performance horses, reproduction, and oncology. Wedgewood Pharmacy is committed to serving both the human health and veterinary markets. Our most-common human health compounded preparations include: urology, obstetrics/gynecology, addiction, dentistry, endocrinology and dermatology. Our veterinary experience includes more than 20,000 preparations for companion animals like dogs, cats, birds, pocket pets and horses along with less-common animals like amphibians, hippopotami and reptiles. Wedgewood’s specialties include ophthalmology, performance horses, reproduction and oncology. Wedgewood’s data was hard to access and siloed in a variety of operational systems. When business users needed data, they had to manually extract the data from various business applications – a painstaking and error-prone process. While data was abundant within Wedgewood, little of it could be trusted implicitly. Wedgewood personnel made the strategic decision to invest in Tableau Online as their visual data analytics platform. Tableau Online’s fully- managed, cloud-based system allowed them to focus their time and effort on data analysis instead of system administration. The Wedgewood team also chose OSI Digital, a global provider of technology solutions for business, to lead the initial implementation and provide training on visual data analytics methodologies and best practices. 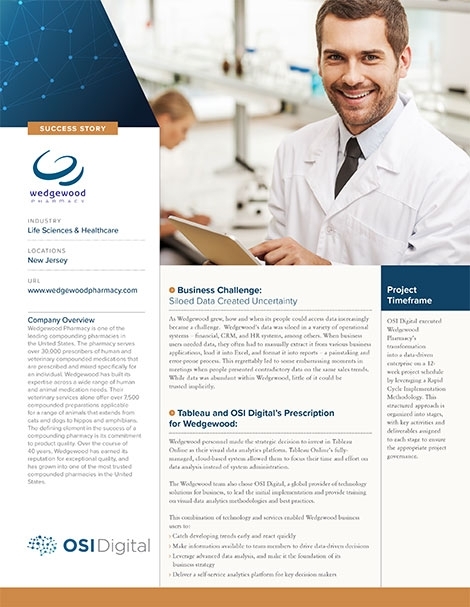 OSI provided Wedgewood Pharmacy with a flexible and scalable solution with robust performance & functionality features. The extensive knowledge transfer to Wedgewood personnel lead to more informed and timely decision-making in the company.